Explanation: Mercury is now visible shortly before dawn, the brightest "star" just above the eastern horizon. But almost two weeks ago Mercury actually crossed the face of the Sun for the second time in the 21st century. 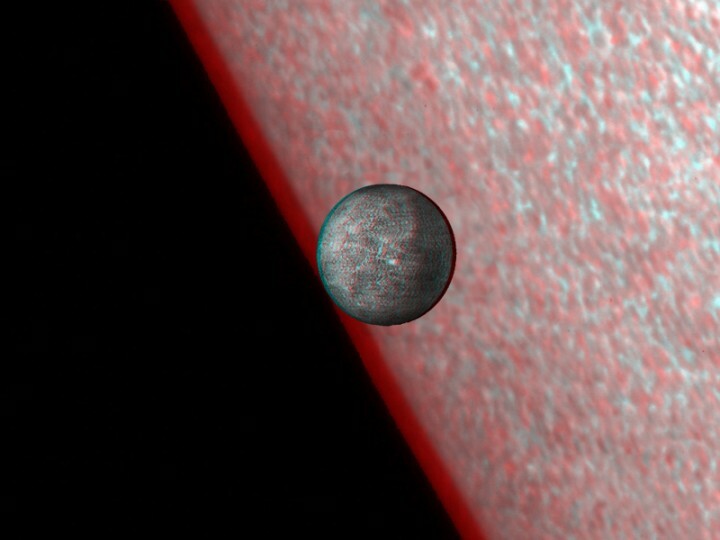 Viewed with red/blue glasses, this stereo anaglyph combines space-based images of the Sun and innermost planet in a just-for-fun 3D presentation of the Mercury transit. The solar disk image is from Hinode. (sounds like "hee-no-day", means sunrise). A sun-staring observatory, Hinode was launched from Uchinoura Space Center and viewed the transit from Earth orbit. Superimposed on Mercury's dark silhouette is a detailed image of the planet's rugged surface based on data from the Mariner 10 probe that flew by Mercury in 1974 and 1975. NASA Official: Phil Newman Specific rights apply.